Seasonal Energy Efficiency Ratio or SEER for short is the measure of air conditioning and heat pump cooling efficiency. This is calculated by measuring the cooling output for a typical cooling season and then dividing it by the total electric energy input in the same time frame. Boiled down this means the greater the SEER rating the greater the energy savings! Energy Efficiency Ratio is very similar to SEER. The better the EER rating the more energy efficient your air conditioning system is considered to be. The difference is the calculations. The calculation is the ratio of cooling capacity of an air conditioning system, in British Thermal Units (BTU) per hour, to the total electrical input under certain conditions. Your air conditioning system is made up of many different components, however there are four major components to consider when repairing or replacing your air conditioning system. When you receive a quote on replacing your air conditioning system it is important to know which pieces of equipment are being quoted for replacement. If you are unsure of which components should be replaced or would like a second opinion contact Ken’s Heating And Air for a free estimate on replacing your air conditioning system. What is the best SEER rating? We hear this question asked whenever someone is researching air conditioning systems or considering replacement of their air conditioning system. The answer that we give is 16 SEER for traditional a/c units and 15 SEER for heat pumps. Most homeowners see a 20% to 40% reduction on their electric bill depending on the age of the equipment that is being replaced. 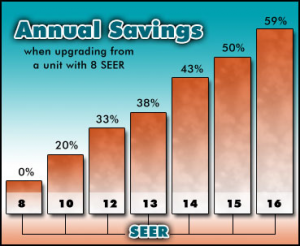 A 16 SEER traditional air conditioning system or 15 SEER heat pump usually comes with a variable speed furnace, which increases dehumidification, an upgraded condenser, and new evaporator coil. If you would like to find out more information about which SEER is best suited for you and your family call us today for your free air conditioning replacement quote.